This luxury penthouse is perfectly located only 6 minutes walk to the 2 mile long fine sandy beach. The spacious penthouse can easily accommodate 6 people. On the ground floor there is an open plan lounge/kitchen/dining area, a downstairs bathroom with shower. The kitchen is furnished to a high standard with granite work surfaces and fitted appliances, dining table/chairs. The lounge is furnished with a comfortable sofa (this can be used as a double sofa bed) and TV. There are large sliding patio doors from the lounge onto a balcony with table/chairs. A marble staircase leads to the first floor. Here there are two double bedrooms which have 1 double bed and 2 single beds (which can be joined to create another double bed), both have fitted wardrobes. The upstairs bathroom has a contemporary design with a Jacuzzi. Both bedrooms have large sliding patio doors onto a large balcony with breath taking views of the Taurus Mountains and a glimpse of the sea. Air conditioning is throughout. The Complex: The penthouse is in a secure and luxurious complex. 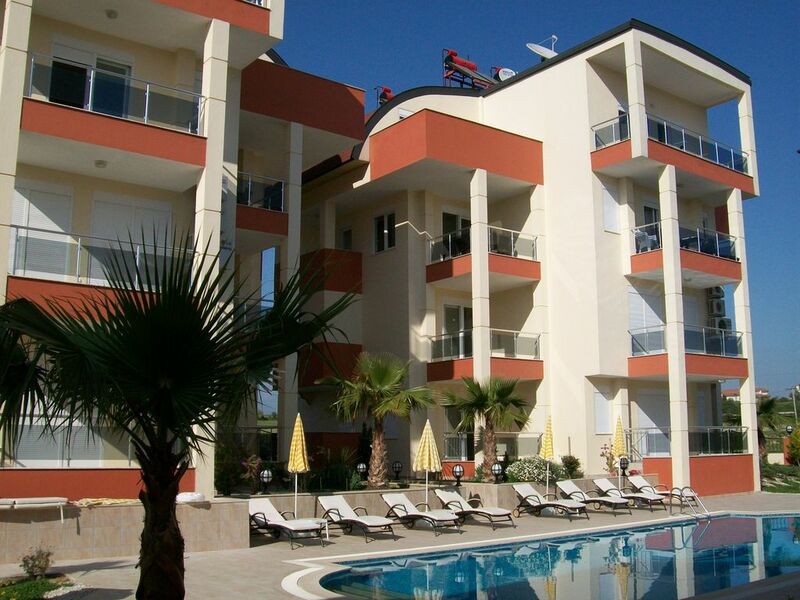 The apartments are served by two beautifully designed central communal pools and a baby pool. The grounds are thoughtfully landscaped with Mediterranean plants and tendered lawns supported by an automatic irrigation system. Lovely holiday. The 2 bed aperture this large and well equipped. It was on the third floor and had 2 large balcony. The sofa in the lounge is as big as a large double bed when pushed together. 2 gorgeous communial pools. Located inveteeen 2 large parts of Side. The management team Sara and Capan are extremely helpful and the transferred arranged by graham and Farhana were brilliant. We will definitely be returning. We were pleased with the cleanliness and the apartment was well equipped. The welcome pack was very good, as arriving late it was nice to have a drink and something to eat. Lovely apartment, plenty of out door space. Flat was lovely an spacious. Plenty of storage space. Had a lovely time. Very nice yo have some shopping done for essentials. Just a few down points nothing major. Needs another table in balcony cos we like to have breakfast there but couldn't. Need to replace the plates etc as most of them are chipped and scratched. There was no hand wash or soapin either of the bathrooms. It would b nice if there had been even a small soap like in hotel rooms or similar. The only advice from my part is when the apartment is getting cleaned if they would just top up with about 2 dishwasher tables. Bit of washing powder (there was some when we went). An hand wash an some bleach for bathrooms. So client do not hav yo Ho shopping straight away. All in all had a lovely stay in Side an in the apartment. Caretaker Ramzàan was very helpful an does a fantastic job of keeping the pool an ground nice an tidy. The property is well-located in a quiet area, but only a 10 minute walk away from the beach.The grounds are well-maintained and the pool is kept very clean. We had the pool to ourselves for most of our stay. The apartment is clean and well-equipped with everything you need, we even had beach towels! The balconies have good views and provided a great place to sit and relax. Farhana was a pleasure to deal with from the beginning, she also arranged the transfer from the airport which worked well. The driver was waiting for us , even though we were early. He couldn't have been more friendly and helpful and was a great source of information about the area and the apartment. We ate out at several places, but kept going back to Umut's Restaurant, where both the food and service were excellent. The apartment is great value for money and we would definitely recommend staying here. First I have to tell thanks to the driver who met us at the airport. He was very friendly and just in time. It is an excellent service. Our impression of the flat was very good. It is a wonderful complex, clean and quiet. Pool and garden are ideal for relaxing. I can honestly recommend it. Some Shops are iclose to the house and offer the most importants things. A walk to the beach takes less than 10 minutes. Some Hotels offer free sunloungers. Most of the restaurants are very good and not too expensive. Many thanks to Farhana. Later we will come back for another holiday! The flat was lovely. The gardens are well maintained and the pool is super clean. Close to the beaches and about an hour plus walk to the harbour. The promenade walk is beautiful. I have no hesitation in recomending this accomodation. The owner is a delight, from the time you make your booking, to the time you arrive. Thank you Farhana for sharing your rental.